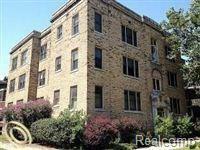 Very spacious 1 bedroom, 1.5 bathroom, exposed brick condo. Historic woodbridge neighborhood/ midtown. Everything is newer. Custom slate flooring and new carpet(bedroom). Jacuzzi tub in master bath. In unit washer & dryer. Art deco glass doors, radiant heated floors and exposed brick throughout loft. Across the street from Wayne State University athletic field and campus. Very close to CCS & Detroit Medical Ctr .